Professor Donald Pease has been known to read Dr. Seuss stories to his cats every now and again. What's more, he says, they seem to understand. Such is the universal appeal of the whimsical tales penned by Dartmouth's Theodor Seuss Geisel '25, better known to millions as Dr. Seuss. Pease, who is a professor of English, Comparative Literature, and African-American Literature; the Avalon Foundation Chair of the Humanities; and the chair of the Master of Arts in Liberal Studies Program, has written a new biography of Dr. Seuss, titled Theodor SEUSS Geisel, that he calls "a labor of love" for many reasons. Pease has been interested in Geisel's life and work since 1990, when he held the Ted and Helen Geisel Third Century Professorship in the Humanities. "As a consequence of having that professorship, I felt a certain indebtedness to the benefactor," Pease says. "That led me to an examination of his life and the relationship between his life and his works." In addition, in 1992 Audrey Geisel (Geisel's second wife, after Helen's death) asked Pease to explore the academic research on Seuss. Observing that "a lot was missing" in academia when it came to the beloved author, Pease decided to fill in a few blanks. He began to turn his extensive research into a book in 2008, when Oxford University Press approached him about writing a Seuss biography for their Lives and Legacies series. "An editor at the press had seen The Political Dr. Seuss (2004), produced by Ron LamotheI," says Pease. "I was a talking head in that documentary, and the editor liked what I said." He "began the book in earnest then," enlisting the help of Presidential Scholar Karen Iorio '10 and late Dartmouth librarian Edward Connery Lathem. There was also a deeply "personal dimension" to the project, says Pease, as it coincided with the death of his brother, twelve years his junior, to whom he had read Dr. Seuss stories as a child. "I worked through his death by studying the author," Pease says. "My work on this biography is a labor of love rather than part of my usual research." And love, Pease figures, is the reason Seussian tales transcend the typical barriers of readership. "Each one of Seuss's stories constitutes an effort to create a loving bond that can't be dismantled or undermined by surface antagonisms," he says. 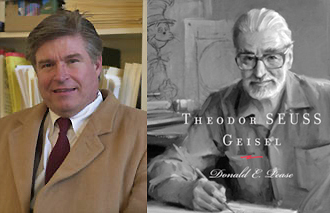 Pease compares Geisel's "visionary powers" to those of Walt Whitman and Henry David Thoreau. "In Seuss there's a deep conversation across races, across ages, across generations, across cultures, across religions," he says. "There's a consistent message that something is between human beings that cannot be betrayed by ideological differences." All Seuss stories are connected by one thing: "the unconditioned laughter of childhood — the sheer pleasure of fun that is funny," not mocking or belittling. And Geisel knew a thing or two about being belittled. The child of German immigrants, young Geisel was frequently teased for the actions of his imperialist fatherland during World War I. "Kill the kaiser's kid! Get the Hun!" schoolmates said. Through these "word wounds," as Pease calls them, Geisel learned the power of words. Later, in his professional life, he used this power negatively, creating propagandist cartoons during World War II. But after the U.S. bombing of Nagasaki in 1945, Geisel resolved to remove all "war mentality" from his work. "He felt that because of his satire and aggression, he had become the bully," like the kids who had once bullied him, Pease explains. Writing literature for children enabled Seuss to reharness the power of words positively. "He released his aesthetic structures from logics of invective," says Pease, and began penning tales that entertain and educate with rhymes rather than ridicule. More than anything, Pease hopes that readers of his new book come to understand Geisel as a complex, resilient man, one who never failed to transform an "experiential loss" into a victory despite the odds. "Dr. Seuss was a guardian for a man, Theodor Geisel, who felt he'd reached terrible impasses at crucial moments in his life. Through Seuss, Geisel discovered the inner resources to get over those impasses," says Pease. "I hope people take away the sense that all human beings can turn what they feel is an insuperable obstacle into the basis for achieving new possibilities." Brittany Coombs '10 is the Alumni Relations Web writing intern.